ACCESS NYC can help you assist your New York City clients to find out if they may be qualified for 40 government program services and help them apply. ACCESS NYC is redesigned to be intuitive and easy to use, but it can be helpful to navigate the details with an expert. Our Training and Outreach Team can help your organization learn how to use the website to help you serve your clients. Our team offers training at our training location, provides presentations for your staff or clients and participates in your public events. 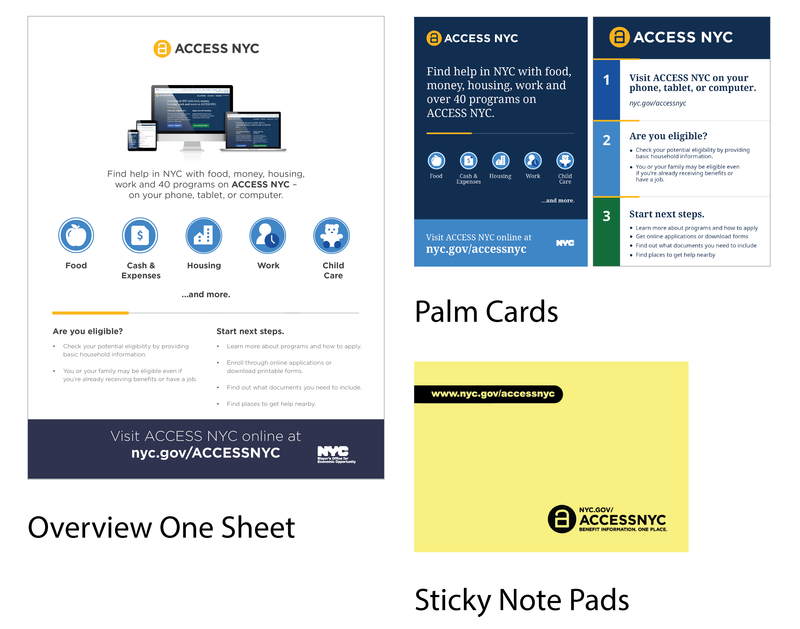 We also provide printed materials and brochures on ACCESS NYC. All Training and Outreach services are offered free of cost to your organization. Attend an ACCESS NYC training session or invite us to an event. We host ACCESS NYC training sessions every month at our Downtown Brooklyn office. Please register to attend. Invite us to your public events such as fairs, conferences, and open houses and we can participate to give your audience information about ACCESS NYC. Please get in touch if you’d like to invite us to an event. We have free print and digital materials available for you to use in your office. Overview One Sheet – print your own! Small Poster – print your own! If printing is not for you, come by our office to pick up these materials. Please schedule time in advance with your request. Contact us if you need additional assistance. Subscribe to our quarterly newsletter to keep you up to date about what is happening at ACCESS NYC and featured programs. We can help you add an ACCESS NYC link to your Website. We can provide you with the ACCESS NYC logo and text to include with the link. Contact us for more information.